I’ve been nominated for my first blog award! | Read.Write.Discuss.Repeat. I’ve been nominated for my first blog award! Following on from Tuesday’s post, the bewildered 20-something writer (http://thebewildered20somethingwriter.wordpress.com/), has nominated me for the Liebster Award! I’d like to thank her (again) for the nomination. She herself has a wonderful blog which I think you should have a good look at. Her mix of blog posts about all kinds of things from Miscellaneous Monday Mornings, Epic Quote of the day, Inspiration, Writing and much much more as she ventures into the real world following graduation, are always a good read. After doing some research and finding a page showing me exactly what the award was (see below), I’m proud to have been nominated for it and glad to accept it. In short, it is a blog award for smaller blogs with 3000 followers or less and is designed to help get said blogs out to a wider audience. The word ‘Liebster’, which is German, has several definitions which include dearest, sweetest, kindest, nicest, beloved, lovely, kind, pleasant, valued, cute, endearing, welcome and sweetheart. I would also like to thank Lorraine Marie Reguly who took the time to create the page with the full this, that and the other of the Liebster Award ((http://lorrainemariereguly.wordpress.com/2013/05/02/the-liebster-award-the-official-rules-my-first-blog-award-and-a-few-personal-secrets-revealed/) and take this opportunity to ask you to visit her new blog, http://poetryperfected.wordpress.com/, which is another new addition to her blogging world. What inspired you to start writing/blogging? I wanted to write ever since I took a Film Studies course at college in 2001. One assignment in particular required me to create a character and give him or her a back story. I did this with gusto which surprised me as I was doing it. I received some good feedback from my teacher and from there I wanted to write. I stopped writing regularly after a while but then picked up the pace around four years ago. I saw setting up a blog as an extension of my writing and a way to talk to other writers and to get their feedback and anything else that could help me with my writing. I also want to help others in any way I can. If you could shrink any animal–real or mythical–so that it was pocket sized, what animal would you shrink and keep as a pet? A Tyrannosaurus Rex. I would carry it around in my pocket and if anyone annoyed me, I’d let Rex have a go at them. Name three guilty pleasure books and/or movies that you’re sorry you’re not sorry you like (say that three times fast). I’ve got two films, Legally Blonde and Clueless, and a TV series Gilmore Girls that are my guilty pleasures. But no books I’m afraid. Agamemnon Metallica Austin Hitman Eastwood. What inspires you creatively, i.e., what gets your creative juices pumping again when you’re in a bit of a slump? If I find myself in a slump I always like to either go for a walk, watch my favourite film (The Good, The Bad and the Ugly) or listen to Metallica. I usually see or hear something which gets me going again. If you knew you only had one hour before the zombie apocalypse, what would you do? I’d make sure my nearest and dearest were all prepared then get a big stick, attached a knife to the end of it, and let them come! Name the weirdest/funniest/coolest/most memorable/etc. dream you’ve had? I can’t remember any dreams fully but I do remember part of one that was a murder mystery/horror story which was all in someone else’s dream. They woke up from it, and then I woke up from it in the exact same way. What advice would you give your six-year-old self? Don’t worry about it. Just keep doing what you’re doing, and you’ll be fine. Oh, and when you fancy a girl for the first time, play it calm and collected. What are the five things that make you the happiest? My Family. My Friends. My Girlfriend. My Writing. Any travels I go on may they be big or small. Star Trek. Only because the new movies are brilliant. I can’t click with my fingers on my left hand. I’ve never had a kebab. I finished 3rd in a width swimming race in primary school. I haven’t completely shaved my beard off since 03/08/2012. I like to listen to Britney Spears every so often. I hope to get married and have children one day and be like my parents are now, still very much in love, when I’m their age. I have an older sister. Along with a brother in law and an awesome nephew. There is an option to not carry on this award and ignore the part about nominating other blogs. I however, believe this is a great thing to be doing for each of us with smaller blogs trying to build an audience and enjoy the whole experience of blogging. 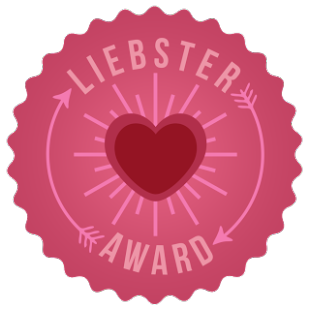 I’ve chosen to nominate three blogs that I currently follow that fall into the Liebster award category. I have enjoyed following each of these blogs and hope I can help them to grow. And, these are the questions I would like each of my nominees, if they choose to accept the award of course, to answer. 1. What are the last three books you have read and why did you decide to read them? 2. If you could be any cartoon character, which one would you be and what would be the first thing you would do? 3. Godzilla has just attacked your home town, what do you do? 4. What is your favourite thing that you own and why? 5. When did writing become so important to you? 6. The world is about to end in 30 minutes, what do you do? 7. What is your favourite film and what is your favourite scene from that film? 10. What are the most important things in life to you? Ok. Well, that’s this post done and dusted. If you know of any blogs you think deserve this award, get nominating ASAP. Oh, sorry one last thing, here are the rules for accepting the Liebster Award.